Qmee Reviews - Legit or Scam? Customers who are interested in this service will be happy to know that you can sign up for it and try it out for free, as well as that you are able to withdraw your money whenever you choose to your PayPal account or to a charity registered with Qmee. 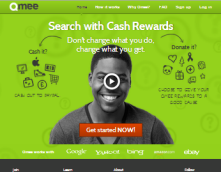 Qmee is similar to a cashback shopping rewards program like Swagbucks, where customers earn cash back on purchases they have completed from retailers they found through the Swagbucks website and links. Qmee takes this same concept and applies it to market research instead of shopping. Their members will search products and items using the major search engines like they always do, but Qmee sponsored search results will appear on the left hand side of the screen. These search results will not only be relevant to your search, they will also have a cash value attached directly to them. Users who choose to visit these sites will have those cash values deposited into their Qmee accounts. Companies are willing to pay a lot of money these days for information about how people search for things online, as well as how long they visit a website and what they click on while they’re there. Companies that partner with Qmee pay them for collecting this information for them, and in turn they are able to provide cash rewards to their members. Members who are willing to let Qmee share their personal demographics with companies will receive higher cash value rewards, because the companies are willing to pay more when they know they are targeting the right audience. To be clear, demographics includes information like users’ ages, residential zip codes, marital status, whether or not they have children, and perhaps information on personal hobbies and habits. It does not include personal information like your name or phone number. In addition, customers who do not wish to maintain this service can cancel their accounts at any time.